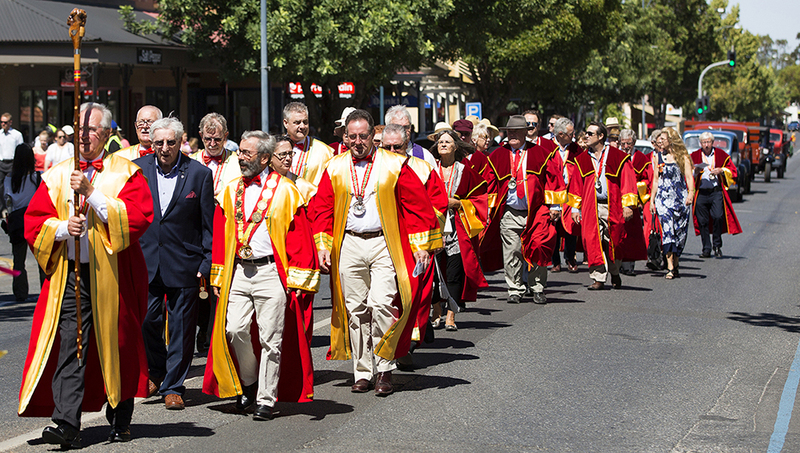 The wine fraternity Barons of Barossa was founded in 1975 by a group of well-known Barossa wine industry personalities. George Kolarovich (Barossa Co-operative, Kaiser Stuhl) was elected as the first Grand Master. Other founding Barons were Wyndham Hill-Smith (Yalumba), Colin Gramp (Orlando), Bill Seppelt (Seppelts), Sir Condor Laucke, Bruce Hoffmann, Peter Lehmann and Cyril Henschke. The fraternity is administered by the Grand Council which is elected biennially. Membership of the Barons of Barossa is by invitation and is offered to those who have made an outstanding contribution to the Barossa. New Barons are inducted into the fraternity in a colourful ceremony and membership is for life. The focus of Barons of Barossa has remained unchanged since its foundation. It continues to proudly and enthusiastically support Barossa wine, viticulture, gastronomy, heritage and the arts. The Barons have a long philanthropic history and have initiated and funded numerous Barossa community projects, including The Barossa Cellar. The Barons provisioned a specialist wine library at the Roseworthy Agriculture College and researched and published the book "Vineyards of the Empire" which is still recognised as the definitive history of the Barossa wine industry. In more recent times, the fraternity has established the Barons Foundation and the Bruce Thiele Memorial Trust, both of which provide funding for significant community projects. In 2011, the Barons of Barossa launched the concept of The Barossa Cellar to collect and preserve the very best wines of each Barossa vintage. This collection, curated by a panel of winemakers, is cellared for a minimum of 10 years before being used to promote Barossa wines to a global audience. In 2017, The Barossa Cellar collection, took a significant step forward when the Barons purchased some land and committed to building The Barossa Cellar to house their significant collection of Barossa and Eden Valley wines. Read more about The Barossa Cellar. Today, Barons of Barossa are a recognised part of the rich fabric of the Barossa. They continue to play an important philanthropic and symbolic role in the region and its world-renowned wine community. The Barons' motto is "Glory to Barossa".